We love hot dogs in my family! Because my husband, Stacy and I are such big fans of hot dogs, we have an ongoing ‘hot dog tour’ that we do. We like to look for the local favorite hot dog place on our journeys. Well of course we both thought I should share that journey on my blog. The Hot Dog Tour has it’s own page on the blog, here. Be sure to click over and see the places we have shared so far. Having lived in the middle Georgia area most of my life, it would just be wrong not to share the local favorite, Nu Way. 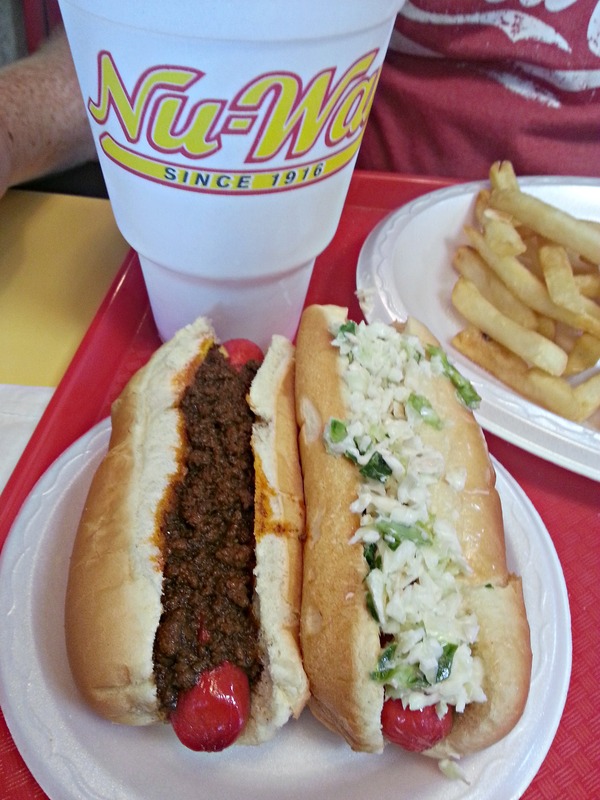 It’s where the locals eat in Macon, Ga.
Order you dog ‘all the way’ for mustard, onions and chili sauce. 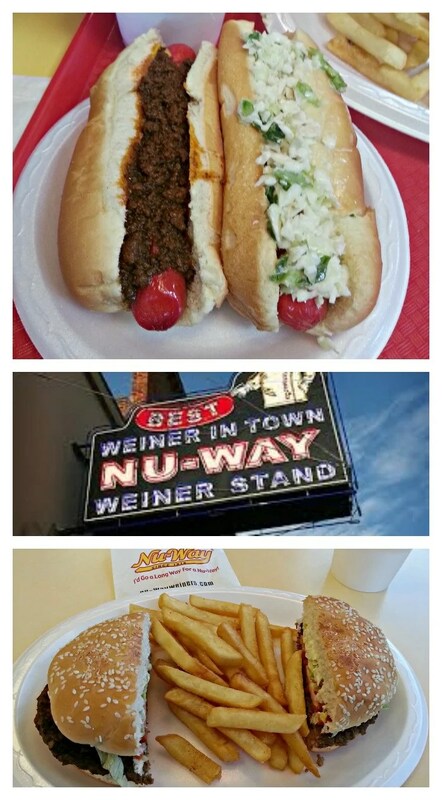 Nu Way has really good slaw so a regular order for me is one of each along with a soda swimming in their famous flaky ice. New York times voted the slaw dogs as No. 1 in the nation! I always get the slaw dog and Stacy always gets both. Not only would be go back but we make it a habit! We give Nu Way four thumbs up, my thumbs and Stacy’s too! 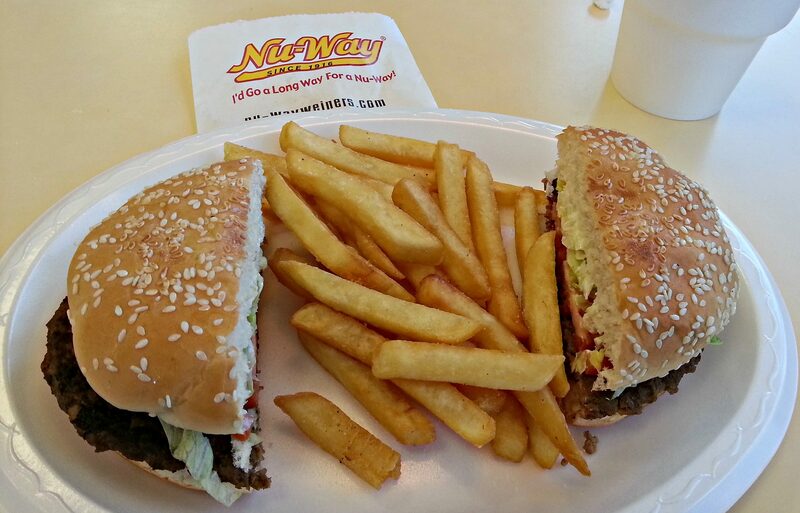 Even though we are on the Hot Dog Tour, we simply must mention the Mega Burger at Nu Way. I do not have a habit of ordering hamburgers in restaurants but sometimes I actually skip the hot dogs and get the Mega Burger at Nu Way! Author and news columnist, Ed Grisamore recorded the history and legacy of Nu Way in his book, The Is More Than One Way To Spell Wiener. Included in the book is why the word ‘weiner’ came to be spelled wrong for the Nu Way restaurants. The secret to grilling a Nu Way hot dog is revealed in this You Tube video shared by The Macon Telegraph. With about 9 locations in 3 middle Georgia cities, you won’t have to go too far for a Nu Way. I love a good hot dog, too! I’m from the Windy City and we do boast the best “Chicago Style” hot dogs, but it is interesting to see how other areas of the country do their dogs. lol Do you ever take trips for the sole purpose of finding a new hot dog place or do you usually just try to find one when you are on a trip for a different reason? A hot dog tour…what a fun idea! Looks like you had fun. Thanks for sharing at the #HomeMattersParty – We hope to see you again next week.